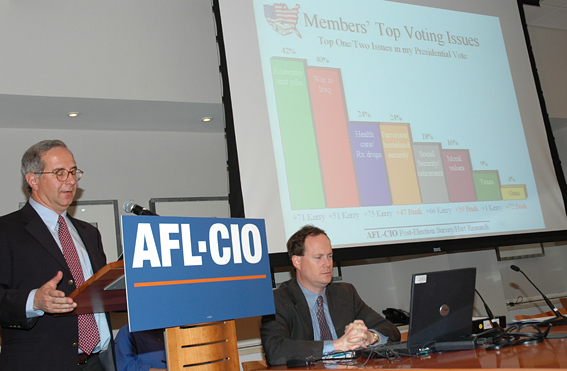 AFL-CIO Organization: A federation of 65 affiliated national unions. The Executive Council, which oversees the daily work of the AFL-CIO, comprises 51 vice presidents and the three officers (President John Sweeney, Secretary-Treasurer Richard Trumka and Executive Vice President Linda Chavez-Thompson) who are elected in conventions held every four years. "Biggest, Most Unified Labor Program Ever"
The AFL-CIO put together what it described as “biggest, most unified labor program ever” for the 2004 campaign. The federation's political budget for the cycle was about $45 million. AFL-CIO's Labor 2004 program placed a heavy emphasis on member to member contacts such as workplace flyers, home visits, and calls. In terms of organized labor's activity, AFL-CIO's Labor 2004 was just the tip of the iceberg; a number of individual unions made substantial efforts of their own. SEIU's "Fight for the Future Campaign" included more than 2,000 members working full time in battleground states and a total investment of $65 million, which it described as "the largest investment by any single organization in the history of American politics." The investment included the largest contributions to America Coming Together ($26 million), America Votes (approximately $900,000) and to the AFL-CIO's Labor 2004 program. AFSCME's "Take Back America 2004" included members putting an estimated 1.7 million hours into campaign-related activities and projected spending of $48 million on political activities in 2004, including $15 million in political action funds. According to The Election After Reform (Malbin, 2005), labor unions donated $110.9 million to federal 527s in 2004 ($94.4 million afer transfers). Ten unions donated more than $1 million. The biggest donors were the SEIU Political Education and Action Fund ($55.0 million), AFSCME Special Account ($27.6 million), and the AFL-CIO COPE Treasury Fund ($11.2 million). 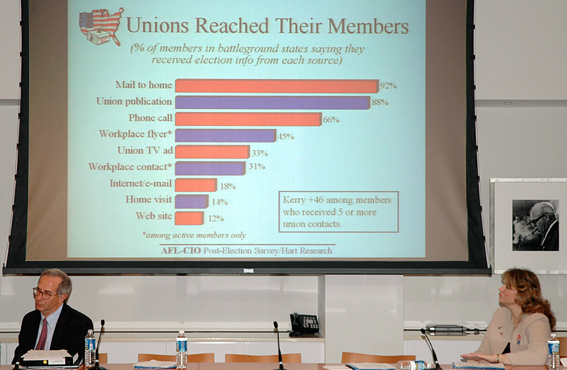 Nov. 3, 2004--Pollster Peter Hart discusses union members' voting at AFL-CIO headquarters. 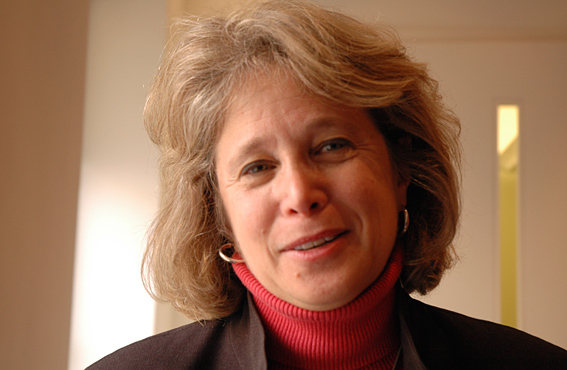 Nov. 3, 2004--AFL-CIO Political Director Karen Ackerman manages a weary smile. "BCRA and the 527 Groups" chapter in Michael J. Malbin, ed. 2005. THE ELECTION AFTER REFORM: Money, Politics and the Bipartisan Campaign Reform Act. Lanham, MD: Rowman and Littlefield. 2004, 2005 Eric M. Appleman/Democracy in Action.